Family Poaceae Barnhart, genus Triticum L.
n=28, 42. Annual plant. Medium bushiness (2-3 stems per plant), rarely high (4-6 stems per plant). Fibrous root system 0.5-1.5 m in length. Stem usually hollow, 40-160 cm in height, with 5-6 nodes. Leaves linear, flat, 16-25 cm in length, 0.6-1.5 cm in width; where the leaf sheath meets the leaf blade, there are pale-green ligula and auricles that tightly surround the stem, which are usually moderately developed and ciliate. Rachis is zigzag, denudate or slightly pubescent; there are spikelets on its ledges, forming two rows on the lateral sides. Ear is dense, with long parallel aristas; depending on the variety, it can be short (6 cm), medium (6.1-9 cm), or long (9.1-11 cm). Spikelets are assidenous consisted of 2-5 flowers; upper one is not developed. Spikelet glume is coriaceous, without longitudinal rugosity and a depression near the base, with wide, well-marked carina. Androgyne flower protected by bicarinate inner palea with two carinas and aristate lemma, which is bigger and has an arista (8-14 cm for aristed sorts and 1-10 cm for unaristed sorts). 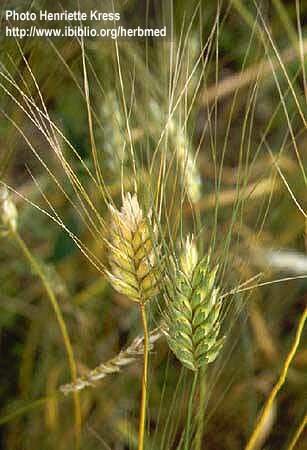 Seeds glabrous, yellow, orbicular to lengthened, rotundo-triangular in cross-section, usually glassy. Weight of 1000 seeds ranges from 22-30 g (small) to 55-60 g (very big). Characterized by great diversity of forms. Most widespread varieties include Alena, Leucurum 21, Prikumchanka, Shark, Ak-Bugda 13, Novomichurinka, Odesskaja jubileinaja, Rubezh, Donchanka, and Zhemchuzhuna Dona. Origin unknown. The first record of the species in Russia dates to the mid-19th century in 1856 A.D. Bazhenov describes it under the name of Sary-Bugda, which were cultivated in the Caucasus. The crop distribution area within the former USSR covers about 200,000 hectares. Cultivated in Transcaucasia, republics of Central Asia, in the forest-steppe and steppe of Ukraine, in southern Russia, and in the regions with mild winters. Less resistant to soil drought in comparison to bread wheat, but more tolerant of atmospheric drought during seed formation. Demands high soil fertility. Requires much light. Optimal temperatures during the first period of growth are 10-15°C; in the winter, optimal temperatures are 6-10°C (day) and 0-3°C (night); in spring, optimal temperatures are 12-16°C; during ripening, optimal temperatures are 23-30°C. Resistant to fungal diseases. One of the main cereals in the world. Grain is characterized by high brittleness and easy yields to crushing. Distinguished by its high protein content and high-quality gluten; therefore, it is very valuable in macaroni production, semolina and fine wheat flour making. Productivity of new varieties reaches 4-5 tons per hectare. Buyukli P.I. 1983. Winter durum wheat. Kishinev: Shiintsa, 223 p.
Dorofeev V.F., Korovina O.N., eds. 1979. Cultural flora of the USSR. Vol. 1. Wheat. Leningrad: Kolos, 348 p.
Samsonov M.M. 1967. Strong and hard weats of the USSR. Moscow: Kolos, 168 p.
Vehov V.N., Gubanov I.A., Lebedeva G.F. 1978. Cultural plants of the USSR. Moscow: Mysl', 336 p.